Young and the Restless spoilers for the next two weeks show Cane Ashby (Daniel Goddard) wants to get Lily Ashby (Christel Khalil) to forgive him. Now that Lily gets out of prison early, she is set on divorcing Cane and moving away from GC. Cane, however, wants the love of his life back. In the upcoming two weeks on the NBC sudser, he strives to make this happen. To start the week off, Y&R spoilers say Victoria Newman (Amelia Heinle) and Nikki Newman (Melody Thomas Scott) learn Victor Newman (Eric Braeden) is paying a Vegas therapist. This is out of character, so they know something is up. However, he’s not around for them to question so their thoughts run wild. Meanwhile, Young and the Restless spoilers promise Ashley Abbott (Eileen Davidson) and Jack Abbott’s (Peter Bergman) battle isn’t done. Things escalate as they prepare to continue their fight. Also on Monday, Ana Hamilton (Loren Lott) must face her fears. Later, she might even conquer this anxiety. Tuesday on Young and the Restless, spoilers follow Nikki as she confides in her longtime friend Paul Williams (Doug Davidson). Nikki wants to know where her husband Victor has gone off to, and she might get some advice (and even some help) from Paul. Nikki isn’t the only one confiding. Rey Rosales (Jordi Vilasuso) ends up confessing the truth of Lola Rosales’ (Sasha Calle) attack to Sharon Newman (Sharon Case). He tells her that Mia Rosales (Noemi Gonzalez) is the one who almost killed his sister. However, he begs Sharon to keep this secret. Mia needs to find an alibi today, as Paul may grow even more suspicious of her role in Lola’s attack. 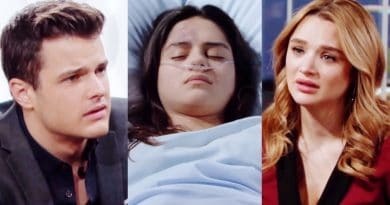 This could be the deal that Arturo Rosales (Jason Canela) makes with his older brother, as Rey strives to protect a pregnant Mia from jail time, predict Y&R spoilers. Rey: "So what's next, you going to keep this going with Kyle?" Cane Ashby tries to make future plans on Wednesday on Y&R. Spoilers show Lily Ashby released from prison in the near future. So, Cane wants to try to make things right with Lily. After all, Lily Ashby wants to divorce him and leave town, something Cane Ashby desperately doesn’t want. Meanwhile, Mariah Copeland (Camryn Grimes) finds herself in potential danger when she receives a threatening message. 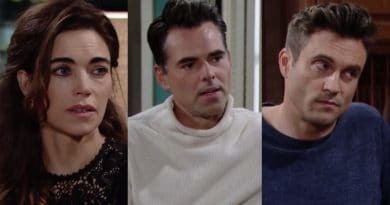 While Mariah stresses about this dangerous note, Billy Abbott (Jason Thompson) asks Victoria to marry him, predict Young and the Restless spoilers. Billy: "Something happen with Lily?" Nikki Newman finds herself working with an unexpected ally on Thursday on Young and the Restless. Spoilers promise Nikki’s search for the truth behind her husband’s disappearances means she’ll take all the help she can get. Elsewhere in Genoa City, Phyllis Abbott (Gina Tognoni) challenges Billy. The former couple doesn’t need much to go after each other. As Phyllis is trying to regain some form of power after being outed from Jabot, she may try to take down Billy in her quest for revenge. Devon Hamilton (Bryton James) attempts to make a comeback on Thursday according to Y&R spoilers. With the help of his sister Ana and his new love interest Elena Dawson (Brytni Sarpy), this comeback of his might be successful. As the week ends on Y&R, spoilers see Abby Newman (Melissa Ordway) doing damage control. As she prepares to open her restaurant while struggling with Arturo’s betrayal, things may fall apart. She and Mia have a lot on the line. Meanwhile, Friday’s Young and the Restless spoilers follow Lily Ashby as she starts a new chapter. Lily wants a fresh start. But Cane Ashby is fighting for their marriage. On Friday, Lily Ashby may leave him for good, if Cane doesn’t convince her to try again. Soon, Christel drops back to few (to no) episodes. Next week, as well as the next few upcoming weeks, Cane Ashby works to fix his marriage to Lily Ashby on Young and the Restless. Spoilers promise Cane knows he has to make things right, as he ruined their marriage in the first place. Lily Ashby wouldn’t ask for a divorce if Cane didn’t get too close to Vikki. However, things are quite different now. Prison changed Lily, for better or for worse. Now that she leaves prison early, Cane finally has a chance to truly fight to win her back. It doesn’t look like Lily doesn’t want to fight for their marriage, though Cane could make her realize that he’s willing to change. Cane Ashby tries to go with Lily Ashby as his date to Abby’s restaurant opening, hoping to reconcile. Cane will do anything to regain Lily’s trust and fix their marriage. In the upcoming two weeks, the sad news of Neil Winters’ (Kristoff St John) untimely death comes out on Young and the Restless. After portrayer Kristoff St John’s own sudden passing, this storyline is meant to honor the longtime actor, giving fans and the cast a chance to pay their respects to the legendary actor and character. After the news of Neil’s passing, many characters return to the fold to pay their respects. Most notably, Malcolm Winters (Shemar Moore), Drucilla Winters (Victoria Rowell), and Hilary Curtis (Mishael Morgan) will return. This storyline will begin on April 23, while the special tribute episode will air on April 29. This marks one of the last episodes for Lily Winters as well as she and Cane Ashby split and she moves on. Don’t miss this poignant final episode and memorial special for Kristoff in the next weeks on the CBS soap opera. Visit us at Soap Dirt for all things Young and the Restless. ‘Young and the Restless’ Spoilers: Billy Wants a Second Chance – With Phyllis or Victoria?